I love the quote above. Children are such a great gift and inspiration. We see that in our juror groups and at our film festivals. We have a Coloring Contest for this month! Kids can color their favorite character for a chance to win over $100 in DVDs! Winners will be announced by December 20th at www.kidsfirstmedia.com and notified by email. Click here to download your favorite character and the entry form. Also, for all homeschoolers and educators, we have also begun a media literacy blog for homeschoolers. Go to http://www.homeschoolblogger.com/CQCM to see how I incorporate media literacy into my own homeschool classroom. I want to encourage all of our readers in the Colorado area to attend our KIDS FIRST! Best Awards events, November 19 and 20 during the 28th Starz Denver International Film Festival. On Saturday, November 19, we will announce the winners of our KIDS FIRST! Best awards, play the award winners as well as a selection other new titles, present the Rocky Mountain Premiere of The Blue Butterfly starring William Hurt and co-host a "Cupcake Social" at the Children's Museum of Denver. Saturday evening, we will announce our five "Best of the Fest" Award Winners during the Closing Awards Ceremonies of SDIFF. A selection of new films from independent producers will be shown on Sunday afternoon, November 20. You can download the official film schedule at www.denverfilm.org anytime after Monday, October 24th. KIDS FIRST! has worked with the Denver Film Society and ArtReach of Denver to provide youth-appropriate films and videos year-round since 2003. "Denver Film Society is excited to expand its successful two-year partnership with KIDS FIRST! by producing and presenting the KIDS! FIRST Best Awards at the 28th Starz Denver International Film Festival (SDIFF28)," says Scott Rowitz, executive director, Denver Film Society. "Denver Film Society and KIDS FIRST! have successfully partnered with ArtReach to offer the Denver area's only regular screenings of family-friendly weekend matinees." Here's a reminder to all our producer readers that our submission deadline for our first quarter of 2006 is October 15, with a late deadline of November 14. So, if you haven't submitted your title yet, please do so now. You may submit directly through KIDS FIRST! or, through withoutabox.com. Next month, we will be announcing our Award Winners as well as our online Holiday Buying Guide. For all you parents, grandparents, or others with young children in your lives, be sure to check back to see what KIDS FIRST! recommends you consider for your holiday gifts. Teaches ASL signs for family members, feelings, and things you find outside. Divided into family songs, outside songs, and feelings. KIDS FIRST! Adult Juror Comments: Excellent. Great presentation. Well organized. It's divided into three sections - family, outside, and feelings. Each is further divided into words that fit into that category. After each word is shown, it shows a variety of children signing the word and doing the activity. Simple words are used that children can easily relate to. Flows well from one part to another. Pace is relaxed but chocked full of information. Encourages experimentation with sign language. May empower very young children to communicate before vocal speech develops. KIDS FIRST! KID Juror Comments: Most kids enjoyed this, particulary the cartoon frog's antics. When they lost interest, he would draw them back to the screens. All enjoyed the music. Many didn't want to watch this but when they did, they enjoyed it. Some said they liked it "because there was a love part." From America's heartland, an acclaimed family recording artist steams ahead with his second collection of railroad songs, My Mama Was A Train. 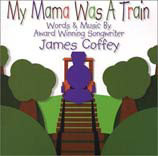 James Coffey includes 15 original and traditional songs, all relating to the magic and wonder of trains. Adult Juror Comments: Well produced. All enjoyed Coffey's beautiful singing. Offers lots of information about trains and familiar tunes such as Little Red Caboose and Down by the Station. One preschool teacher said she would definitely use this in her when they study transportation. A group who had just read Thomas the Train loved that it told them more about trains. Great format, allows kids to sing along, count and pretend to ride on trains. Helps develop children's language skills by talking about something they are interested in. Kid Juror Comments: Enjoyed the music and learning about trains. Lively music got the children moving quickly. Kids related to specific songs such as Build a Bridge, and said they imagined they could build a train bridge. Even older kids enjoyed songs such as Casey Jones. Some groups headed to the library afterwards to find books about trains. Audio. 45 min. ; $14.95; Age: 2-5. BLUE VISION MUSIC. Thomas & Friends: Percy Saves the Day. A. 35 min. Portrays the adventures of a little robot whose greatest wish is to become a real boy. The year is 3000. Gepetto, with the help of his faithful assistant, Spencer the Cyber Penguin, and by the holographic fairy Cyberina, creates Pinocchio, a prototype super-robot equipped for emotions. But before he can be given a heart and become a real boy, Cyberina insists that Pinocchio learn the difference between right and wrong. Spanish track. Ages 8-12. Lions Gate Home Entertainment. Goosebumps: Scary House. A. 44 min. Spookley the Square Pumpkin. A. 45 min. In a world where "the only good pumpkins are found pumpkins," Spookley the Square Pumpkin is shunned by the other pumpkins until a mighty storm threatens to destroy the entire patch. As the storm rages, Spookley realizes "it's fine to be round while the weather is fair, but there are times it's better to be a square!" Ages 3-7. Lions Gate Home Entertainment. The Man Who Walked Between the Towers. A. 10 min. S.
Inspired by the true story of Philippe Petit, a young French aerialist, and his daring 1974 high wire walk between the twin towers of the World Trade Center. The excitement, suspense and reverence of that feat are brought to breathtaking life in this animated adaptation. Caldecott Medal Book; ALA Notable Book; Book by Mordicai Gerstein; Illustrator: Mordicai Gerstein. Directed by Michael Sporn. Narrated by Jake Gyllenhaal, music by Michael Bacon. Ages 5-9. Weston Woods/Scholastic. Raju & I. A. 30 min. Examines the problems of underprivileged children from viewpoint of a 12-year-old upper middle class child, Atul who is too full of himself to notice poverty. Raju's father is a drunkard who beats his son and makes him work instead of go to school. Raju's world is a far cry from Atul's, but that does not prevent them from sharing some fun times together. When Raju disappears, Atul's search for him opens his eyes to a whole new world. The film focuses on the rights of the child and ends with a hope for the future and a pleasant surprise for Atul. Directed by Gayatri Rao, developed for ASEEMA, a non-profit working for street children. Age: 8-12. Animagic Special Effects Pvt. Ltd. Wish you could help keep this fabulous award-winning show? Go to http://www.savereadingrainbow.org/ and sign the petition. Dawn Westlake - We at KIDS FIRST!® congratulate Dawn whose film, A Life of Death, has been accepted into a film festival in Swaziland. Check out her work here. Big Idea - Just in time for holiday cheer and fun family get-togethers, The Incredible Singing Christmas Tree has been released from Big Idea's VeggieTales. "Tech gadgets are so cool, some are even considered fashion accessories," cites blogger and computer guru, Anders Brownworth. "Gen-Y kids don't actually know how tech gadgets work, but would benefit from some basic knowledge." It's true. My eight-year old can use a digital camera and make an animation sequence through pre-made freeware programs such as MonkeyJam. He has no clue how this is possible. That situation won't be getting better anytime soon. If anything, technology is getting more sophisticated. Yet, the more realistic technology gets, the more sociological impact it can make as viewers become immersed in the media experience. Centuries ago, Leonardo Da Vinci revolutionized the world with his drawings. By examining cadavers, he learned to draw sinews and muscle, creating figure drawings that were more realistic than anything before his time. Now technology gurus are changing the art world again, this time in digital dimensions. Gone are the days of flat two-dimensional human renditions moving jerkily on the screen. "3D is getting more sophisticated. Simulation is going to be the big thing there. You won't just be modeling a skin on your character. You'll build it like a real person, from the skeleton up," animator, Thomas Moser says. Viewers will find it easer to relate to the characters. Rob Hudnut, Mattel animator, comments that it was only a few years before Barbie's Nutcracker that CGI was used only to animate "hard things" like plastic action heroes and bugs. It was missing the human element until the Nutcracker broke new ground by adding hair and clothes and movements based on real people from the New York City ballet. Modern technology allows us to created realistically human images for the screen. Reality-based advances apply to music also. "I think the trend in film sound and music is to immerse the listener/viewer more completely in the experience by surrounding them with the sounds." says Mark Hijleh, award-winning composer and professor of music at Houghton College. Hijleh has written music for a number of independent student films, including several recent scores for projects in the graduate animation program at the Rochester Institute of Technology (Rochester, NY). According to Hijleh, technology is allowing sound design and music in films to become more and more complex. Composers must now think in terms of the spatial separation of the sound and music bouncing around from speaker to speaker. The idea of immersing the in the media experience extends beyond drawing and composing to the actual viewing device. Dan Mapes's 3-D TV enters living rooms this spring. This mind-boggling technology allows viewers to watch three different shows in the same room, from the same TV, without seeing each others' screen. You can watch the news while a few feet away your child watches PBS. Your spouse can be surfing the net on the other side of your child. Directional sound or earphones prevent the sounds from interfering with each other. Best of all, the shows can be watched in 3-D, without glasses. Mapes, father of a seven-year-old child, thinks kids will be excited about the crisp colors and detailed characters on-screen. Games become more real and shows more visually appealing in three dimensions. Mapes is also curious about the changes to social mores. According to him, media is almost a mirror of our society. We are currently a two-dimensional civilization, with newspapers, TV and billboards. As we shift from two dimensional to three dimensional through our media, we are creating media more like ourselves and our environment. Will this lead us to view the subjects in the media with a more humane eye? Only time will tell. Go to craft page at www.kidsfirst.org. Oct. 22, 2005, from 8am - 4pm. : Cambridge, MA. Media Literacy Symposium at MIT. Features schools that are implementing media literacy curricula in the K-12 learning space and in after-school programs. Contact Alan for information. Denver Film Society and KIDS FIRST! in partnership with The Entertainment Project offer the KIDS FIRST! Junior Film Critics Club workshop for ages 8 to 13, and a chance for young movie buffs to truly be their own critics. The Entertainment Project will present workshops for youth to train and learn how to review films, and gain real-world experience through viewing, discussing, writing about and giving presentations about films. Selected students from the workshops will be featured in high profile events such as a panel discussion that critiques film, serve as reporters on the red-carpet to conduct interviews with stars and celebrities during SDIFF28 and write reviews for Whose magazine? a youth publication of The Entertainment Project. Last year, two Junior. Film Critics interviewed Morgan Freeman, Denver Mayor John Hickenlooper and other celebrities on the Red Carpet during Starz Denver International Film Festival 27. To register, go to http://whosemagazine.org.or call 303-383-1584 ext.#3. Individuals are welcome, and scholarships are available for classes from schools through TIAA-CREF.